Blackhawk 20O200RD, 20O200BK O2 Bag FREE SHIPPING! Transport oxygen tanks with confidence using the O2 Bag from Blackhawk. Designed to carry a standard oxygen tank and regulator, the carrier is ideal for EMS and first responders. 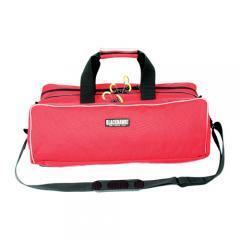 The bag features a high-quality padded interior to absorb shocks and prevent damage to contents. Two full-length external pockets offer additional storage, ensuring everything needed is secured in one bag for maximum efficiency. The zippers are constructed from heavy-duty, military-grade materials and can be locked together to prevent unauthorized bag access. Because safety is paramount, the carrier employs reflective pull-tabs and piping for increased visibility at all times. Reinforced carry handles and an adjustable shoulder strap provide secure and variable carry options for any situation. ©2002-2019 CopsPlus.com: Blackhawk 20O200RD, 20O200BK O2 Bag FREE SHIPPING!